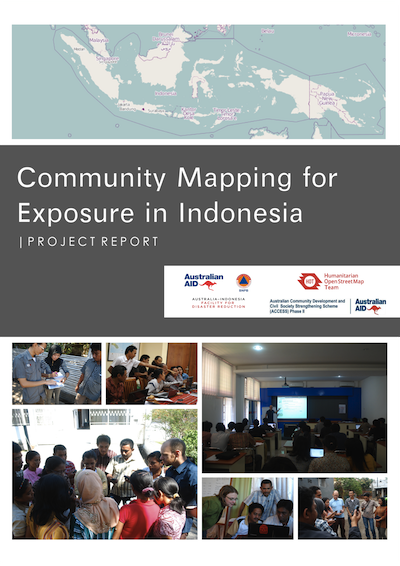 Over the past year the Indonesia’s National Disaster Management Agency (BNPB) and the Australian Agency for International Development (AusAID) through the Australia-Indonesia Facility for Disaster Reduction(AIFDR), the Humanitarian OpenStreetMap Team(HOT), and AusAID funded Australian Community Development and Civil Society Strengthening Scheme Phase II (ACCESS) embarked on a community mapping project pilot. 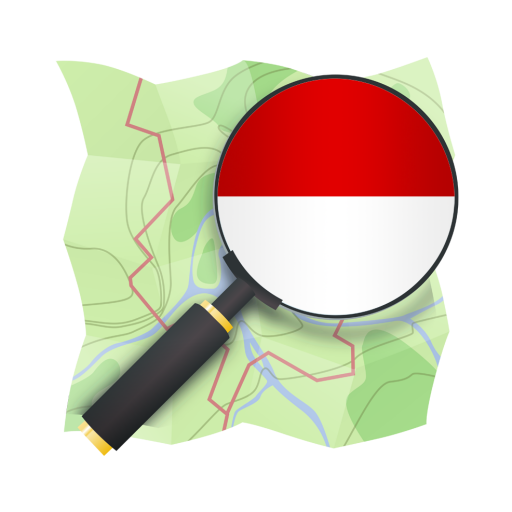 The broad question to be answered by the pilot was “can OpenStreetMap be used to map exposure in Indonesia?” Exposure is an important component in impact models. Hazard is the other component and is the actual event that happens such as a tsunami or earthquake. By using the two together in a model it can estimate how many people, buildings or other important infrastructure could be affected. This pilot was the first attempt to use OpenStreetMap to collect data of this kind and then feed it into scientific models to determine what would happen if a disaster happened in a specific location. You can download the full report by clicking on the cover below. Spatial data on related environment built and vital infrastructure played an important role to strengthen disaster mitigation and response. Unfortunately the availability of detailed spatial data on an operational scale e.g. scale 1: 10,000 1: 5,000 often cannot be met. Official data produced by the government and the data from civil organization are often incomplete or inaccessible. This is where participatory map collected by the community and activist can be used for disaster mitigation and response. One of participatory mapping initiative widely known and used is OpenStreetMap (OSM). OSM fully depends on contributions from community in data collection. A contributor can draw road, building, environment and features in his surrounding or elsewhere. Next, a contributor upload the data with the information into the OSM . By using the internet other users can download data that has been uploaded to the internet. When the official data is unavailable, OSM can become an important alternative. However, the quality of data available from OSM are common issues, questionable by a prospective users. Whether data about roads and buildings collected have accurate position? Whether the description provided on the uploaded features is exactly according to conditions in the field? For other users, the question is whether a building drawn according to the condition the field? Whether roads which show up on the wiki OSM is complete? Questions about data quality such as this are very common and often make government agencies and community groups reluctant to the use of the data. 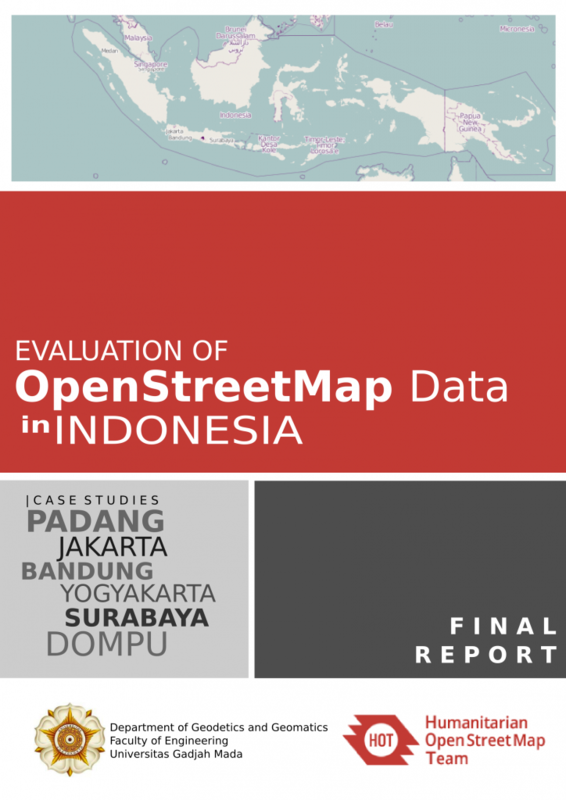 To respond to these issues, research on quality of collected OSM data in Indonesia was done in early 2011 to 2012. OSM data in the city of Padang, Jakarta, Bandung, Yogyakarta, Surabaya and Dompu used as samples of research. The applied method is utilizing large scale maps produced by Government as a reference to measure how low or high the quality of OSM data being collected. In addition, the measurement of samples with mobile GPS carried out to collect comparison data for the statistics test. Additionally attributes of data already collected also evaluated.